It seems life has been moving at a sprinting pace lately and I just can’t keep up. (Remember how I feel about running?) I’m sure I’m not the only one who feels like they could use just 3 or 4 or maybe 12 more hours in a day. You’ve been there too, right? Which is why I’m hoping you’ll forgive me for writing this Mother’s Day post over a week past Mother’s Day. Moms. They’re the best. They do it all and they do it better than anyone else ever could. My mom, aside from raising me all these years, is responsible for my love of food. Her family is Italian so I grew up eating amazing homemade food, like pasta sauces made from scratch and simmered on the stove all day long. I’m sorry to say I didn’t always appreciate it growing up though, probably because I assumed everyone ate that way so what was the big deal? As a teen I had more important things to do than eat (like sleep all day) and although I sometimes helped out with the cooking, I did it begrudgingly. It wasn’t until I was grown and living away from home that I realized how much work my mom put into feeding us kids all those years and how great the food was. Living on my own and missing my mom’s incredible food is what finally motivated me to learn to cook. I craved the comfort of those home cooked meals that I so took for granted living at my mom’s house and the only way to get one was to make it myself. Without my Mom, this site wouldn’t exist today. So thank you, Mom, for feeding me great food growing up, and for inspiring me to cook and bake and love food. To show our appreciation for my mom, my brother’s and I got together Mother’s Day weekend to cook a meal for her. My twin brother cooked an impressive and delicious rack of pork with a homemade chutney, my little brother brought mac & cheese (always a favorite), and to finish the meal I made this Lemon Curd & Cream Layer Cake. You’ll have to forgive me for the lackluster photos. I was in a rush to get out the door with the cake so I didn’t have the time to take proper pictures. What you need to know is that this cake is bursting with lemon flavor. It’s two layers of white cake glued together with a thick layer of lemon curd, then frosted with a fluffy lemon curd & cream icing. 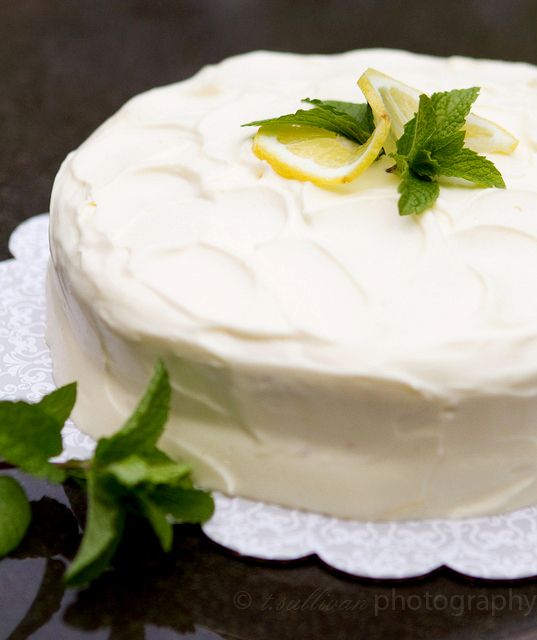 If you have someone in your life you want to thank who loves lemon (like my mom), make them this cake. Nothing says “thank you” like cake! The components can be made ahead and this cake can be assembled in advance, but once frosted you’ll need to keep the cake refrigerated. I found I liked the cake best still cold from the fridge, but the original recipe calls for letting it sit at room temperature for 30 minutes before serving. Make Lemon Curd: Combine all lemon curd ingredients in a medium sauce pan. Cook over medium heat, whisking constantly until butter melts and curd thickens enough to coat the back of a spoon (about 6 minutes). Once thickened, remove from heat and pour through a fine mesh strainer into a bowl. Cover with plastic wrap pushed against the surface and chill for at least 1 hour, up to 1 week. Make Cake Layers: Preheat oven to 375°F. Spray 2 8-inch or 9-inch round cake pans with baking spray. In a medium bowl, whisk together flour, baking soda, and salt. In a small bowl or measuring cup, combine milk and lemon juice (mixture may curdle – it’s OK). Beat butter and sugar in the bowl of an electric mixer until pale and fluffy. Add eggs one a time, beating after each to incorporate. Beat in vanilla extract. Add half flour mixture , then half milk mixture beating on low after each until just combined. Repeat with remaining flour and milk mixture. Divide batter evenly between prepared caked pans, smoothing tops gently with a spatula. Bake at 375°F for 15-20 minutes, until lightly browned and a toothpick in the center comes out clean. Cool in pans for 10 minutes, then flip out onto racks to cool completely. Make Frosting: Using the whisk attachment on an electric mixer, beat cream and confectioners sugar to stiff peaks. Working with half the lemon curd (reserving the rest for filling the cake), fold a few spoonfuls of whipped cream into the curd to lighten it, then fold in remaining whipped cream. Assemble Cake: Place one cake layer, top side up, on a cake plate. Spread with a thin layer of frosting then the reserved half of lemon curd. Top with other cake layer, top side down. Cover top and sides with remaining frosting. If assembling the cake ahead of time, store in refrigerator in cake keeper or loosely covered plastic wrap (with toothpicks to hold away from frosting). Set at room temperature 30 minutes before serving, or serve straight from fridge. I grew up in a similar household (however with Yugoslav food) and I had a similar lack of appreciation! My mother could make anything taste amazing. I thought everyone lived like and wondered what my friends were always on about! Your story sounds so similar to mine. I didn’t start cooking until college and I fell in love. We were spoiled brats. ;) This cake looks and sounds amazing. I just want to swipe my finger through that frosting, it looks so smooth and creamy. I’m totally with you on the Mom thing–my Mom cooked fabulous meals for us when we were growing up and put sooo much time into making them. But I didn’t give it a lot of thought because I also figured that was just the norm, and that everyone ate as well as us. As an adult, I look back on her, on my childhood and her investment in it with SO much appreciation! What a beautiful tribute (and cake) for your mom! I come from a large family of eight, and now that most of us are married, and I’m an adult, I find myself trying really hard to come up with a decent one-dish menu for the whole week just for two persons. I really have no idea how my mom cooked meals suited for everyone’s varying tastes in the past; I have nothing but sheer admiration and respect for all moms now! 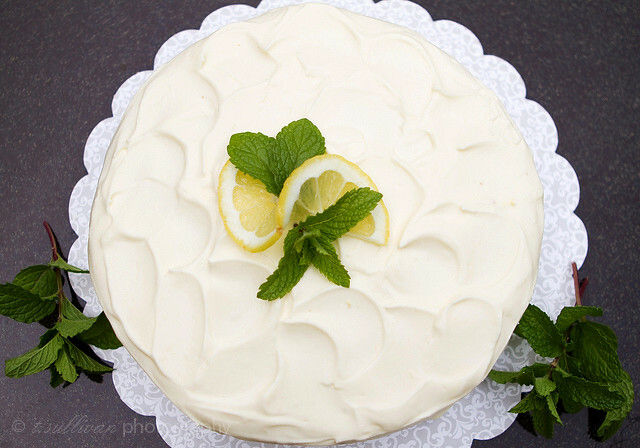 I’m having a lemon cake craving right now! That cake is beautiful, and the perfect Mother’s Day post, indeed. Our moms knew what they were doing; waiting patiently as we grew up, realized our inner love of cooking, and now return the favor. I am enjoying getting to know your blog. I am looking forward to making this for my husband’s birthday this weekend. He asked for a lemon cake but I don’t think he knows this beauty is being made for him. So excited to make this cake! I love lemon cakes – I’ve never made it before (only lemon bars) but it’s my favorite thing when I eat out! Great recipe – thank you for sharing!